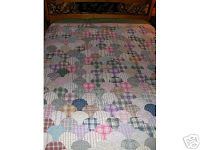 When first starting to quilt, I ignored curved patterns altogether. After disastrous attempts at set-in sleeves, I realized my skills were not advanced enough to approach the mysteries of matching two curved pieces of fabric. 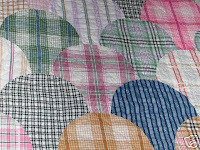 I assumed there was a secret trick that, in time, experienced quilters would share with me. Something like being initiated into the Masons: "All will be revealed." But for right now, there were loads of patterns that were easy straight-line sewing. Why should I attempt curves? Of course you're always drawn to the thing you can't have! The same is true for quilt patterns. I lusted after curves but from afar. A few of the patterns out of my reach were the following: Drunkard's Path, Clamshell, and any Compass-type design you needed to drop into a square. Off limits. These pictures show a few of the many curves I was missing out on. One day I got tired of my ignorance and set out to 'learn myself' Curves. That's the subject of next week's blog entry. 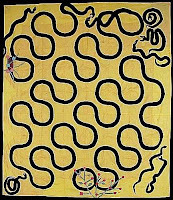 About the quilts pictured in this blog: the yellow and black Snake's Trail is from an ebay auction and was made In Kentucky. 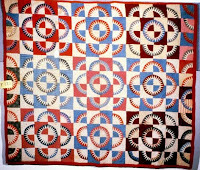 The Clamshell is a midwest quilt c.1930. The Full and Change of the Moon is another Kentucky classic and the North Carolina Drunkard's Path is from my own collection.